Queen West’s Filipino fusion restaurant, Lamesa Filipino Kitchen, recently made renovations to their space including a Tiki-style bar. I was lucky to be part of a group that was invited to sample their new menu including brunch, dinner and late-night menu items as well as cocktails from their new bartender. Having opened in May 2012 at Queen and Bathurst, Lamesa is owned by Rudy Boquila and Les Sabilano. As second-generation Filipinos, they take pride in the food from their childhood but have also adapted it to modern influences. 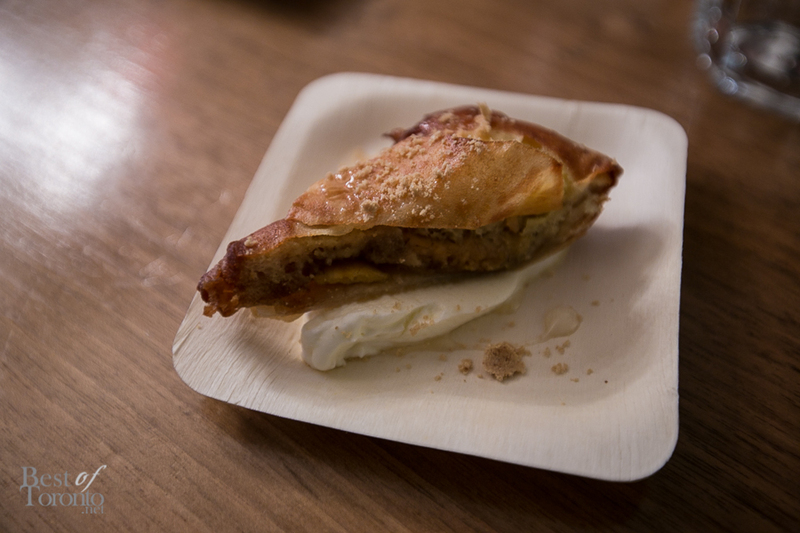 One highlight, offered as a brunch item, was the sweet and delicious “French Toast Turon”. I would have it with a coffee. Other favourites were the “Fried Chicken Adobo” (I could eat a bucket of this) and “Arroz Caldo”. “Fried Chicken Adobo” with crispy fried chicken, pickled chayote, garlic puree, adobo reduction and grilled corn. 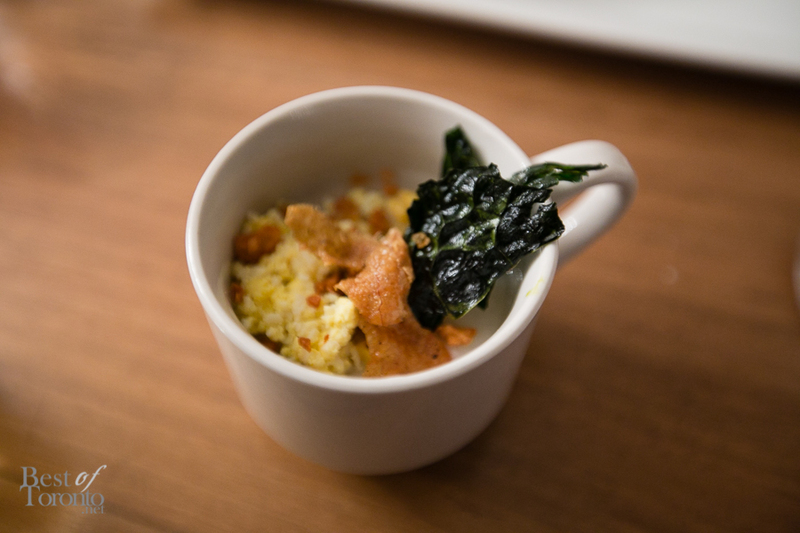 “Arroz Caldo” is Filipino rice porridge with chicken, garlic, chicharron and kale. Really delicious. For vegetarians, there’s the Ginataan Gulay where “ginataan” means cooked with coconut milk and “gulay” means vegetables. The skewer has roasted squash, beans, greens, eggplant and tofu. Served with rice. I love all kinds of cocktails including the Lolo Cool J (ginger, bourbon, pineapple) and the Tita Baby (mango juice and Malibu rum). The atmosphere at Lamesa is warm, inviting and laid back and the prices are reasonable enough to attract repeat visits. The Chef’s Tasting Menu is available for $80 with over 11 courses in the best way to discover the many flavours of Filipino cuisine. Lamesa Filipino Kitchen is open from Tuesday to Friday from 5pm to 10pm, and Saturday & Sunday from 11am to 3pm. Available for brunch, dinner as well as catering services. Located at 669 Queen St. West, visit their website for more info at www.lamesafilipinokitchen.com or on Facebook here. For vegetarians, there’s the Ginataan Gulay where “ginataan” means cooked with coconut milk and “gulay” means vegetables. 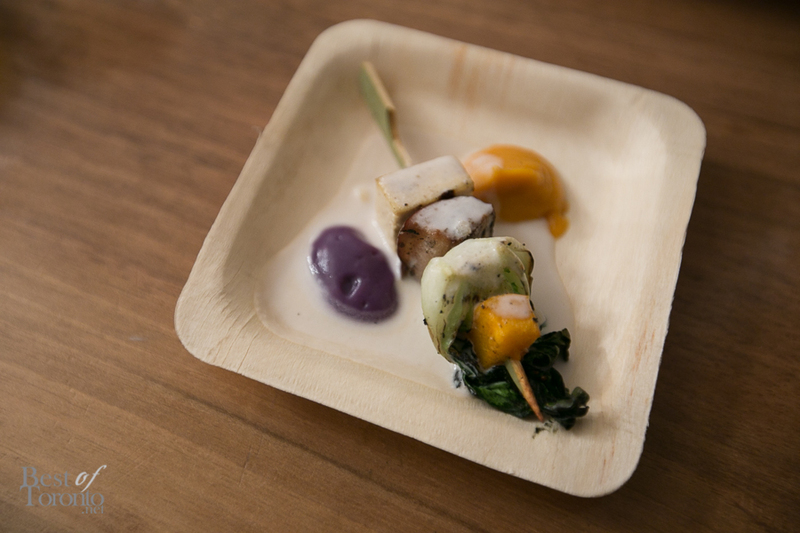 The skewer has roasted squash, beans, greens eggplant and tofu. Served with rice. 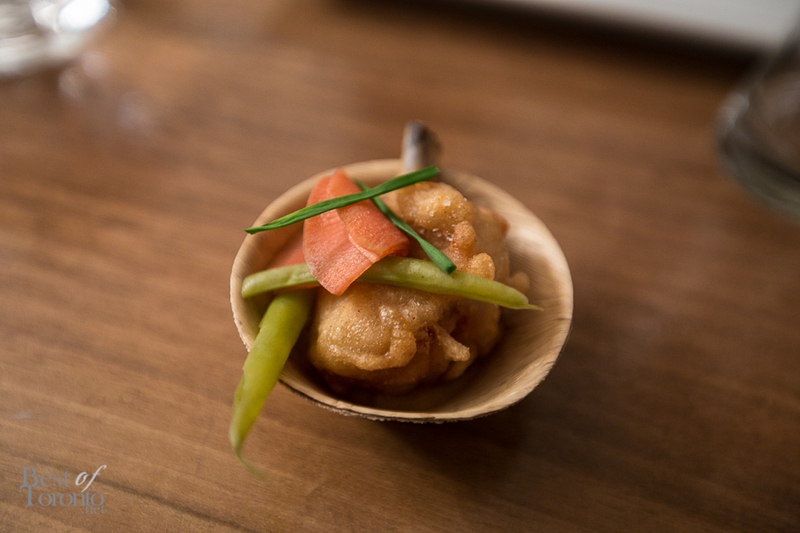 This shared plate: “Krispy Pata” features deep fried pork trotter served with house made sauces. It boasts being a pork lover’s dream. Lavish furs in the Farley Chatto Winter Collection 2014: "Far and Away"